It is that time of year again – time for the Bolinas Museum Miniatures Exhibition. I spent the day framing some diminuitive prints made exclusively this size for this show – Sanctuary #8, Sanctuary #6, and Sanctuary #4 (pictured in this order here). 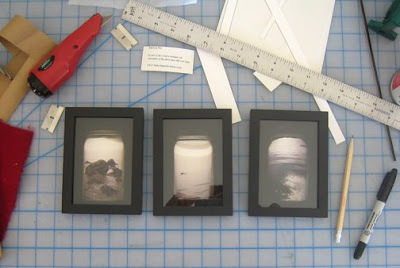 It felt so good to be working with my tools in hand – rulers, cutting knife, framing tape, and more. As someone who has always loved small things, I really enjoy this exhibition. All work must be 6 x 6 x 6 inches or smaller, and 50% of all sales go to the support the Museum. The show opens next week with a reception on Saturday, November 22 from 3-5pm at 48 Wharf Road in Bolinas, CA, and it will be up through December. While cutting and framing today, I kept myself inspired by listening to the Creative Mom Podcast. I just discovered it this week by doing a search in iTunes for “artist mom” – seeking resources on how to balance art and motherhood. You don’t need to be a mom to appreciate Amy’s insights about the creative process. Today I listened to the 9/14/08 episode called “Slippage” – which was a great reminder to be gentle with oneself and give oneself a break. Nice words for me to hug close as I worked today. I’m glad that you found the “Slippage” show… the mantra to “be gentle” came about a year ago… it’s “stuck” with the podcast for sure, and I’m glad it was a good show to listen to. I’m so happy you found the show and that I’ve found your blog!